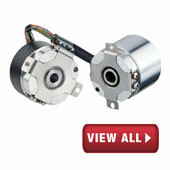 Similar to hollow-shaft encoders, hub-shaft rotary encoders offer direct mounting to a motor shaft or driven shaft but do not require the shaft to the shaft to extend through the encoder. 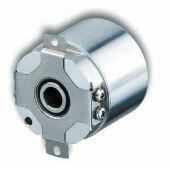 Hub-shaft encoders are ideal for direct mounting in limited space and offer improved sealing with no opening on the back of the encoder. 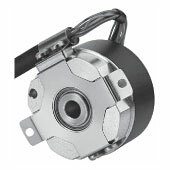 Hub-shaft encoders are mounted with a tether point to prevent free encoder rotation and a plastic sleeve or insert is typically used to isolate the encoder from motor shaft current. 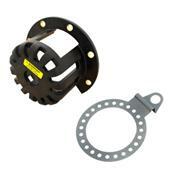 2.0" size incremental hub-shaft encoder. 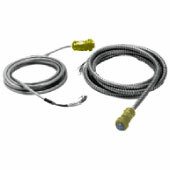 Single ended or differential output with index option. IP66 sealing available. 1-2,540 PPR. 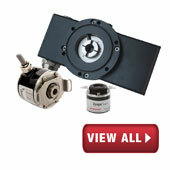 Miniature hub-shafted encoder with flexible spring mount offers <2.0" flange size options and several output options. 100-2,540 PPR. 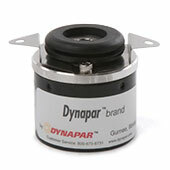 Compact 2.5" size hub-shaft encoder designed for harsh environments offers IP67 sealing and 400G shock 20G vibration rating. 1-3,600 PPR. 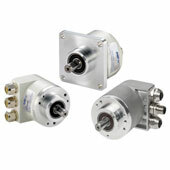 Standard size 25 absolute encoders come with shaft or hub-shaft mounting, multiple protocols including SSI, BiSS, DeviceNet and more. 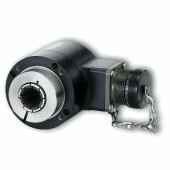 Single-turn hub-shaft 38mm size absolute encoder for servo motors. SSI, BiSS and SSI Gray protocols. Up to 22 bit single-turn resolution.